As early as January 4, 2010, I made an appeal/wish in my blog for the establishment of a “Runners’ Museum & Library”. I made a specific wish to Coach Rio (I am not sure if he is reading my blog then!) and to other runners to come up with an “cooperative effort” where every runner could share in the realization of my wish. But nobody made the move and I thought that if I have a wish to attain, it is upon me to make the MOVE and start initiating such effort. However, I could see that each runner, blogger, race organizer, and race director have their own personal interest to focus on. And as for me as the “initiator” of this idea through my blog, I simply kept silent on the said wish. After two years, I was surprised to see on Facebook about the “100 Miles Cafe” concept that my ultra running friend, Jael Wenceslao, had posted in one of his rare “status” at the PUMAGs (Pinoy Ultra Marathoners Group) Page on Facebook. Months later, I was invited to see for myself where this establishment is located. I would not like to describe in details on what to see and expect in this place. It may not the exact ideal “Library & Museum” concept that I was thinking but it’s purpose as a place where runners, endurance athletes, their guests and families, relatives and friends could meet and share their “stories” to one another and at the same time a place where lectures, forums, and meetings would be conducted, is very fitting for the said place. But I know, in a few months, this place will transform into a “Library & Museum” for all runners/endurance athletes! 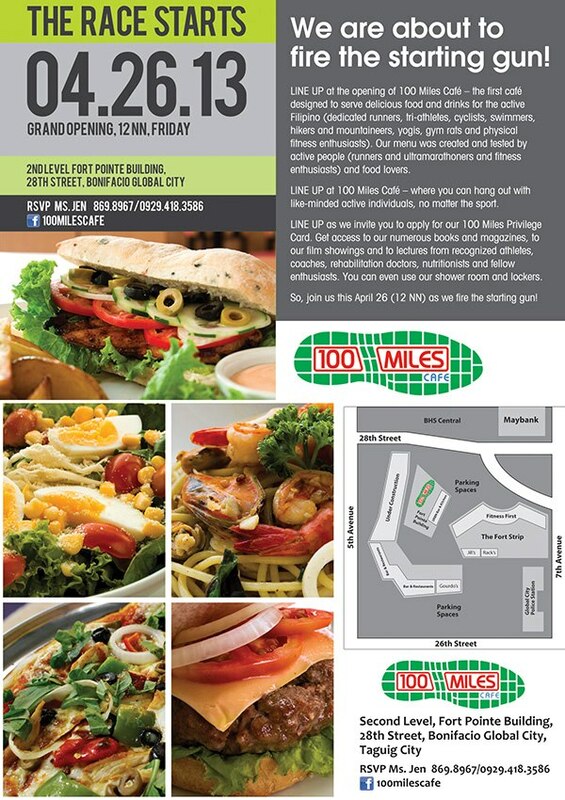 Finally, 100 Miles Cafe will be officially opened with a simple ceremony where runners and other endurance athletes are invited. See you at the Starting Line @ 100 Miles Cafe, 12 Noon, tomorrow, Friday, April 26, 2013! Congratulations To Jael and to the Wenceslao Family! On January 4, 2010, I posted my thoughts for my running wishes in 2010 and beyond.